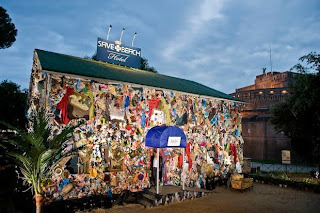 The Corona Save the Beach Hotel, designed by German artist HA Schult, is open until June 7 near Rome's Castel Sant'Angelo, which is located along the Tiber river. "In the ocean, the trash from all continents meets one another. The trash from Africa meets the trash from Europe, meets the trash from South America," Schult said, pointing to the guitars and shoes plastered across the building. "The environmental problem is a global problem. We are living in a planet of garbage," said Schult, whose most famous work is "Trash People," an installation of 1,000 human figures made out of trash. "Trash People" was installed under the Brooklyn Bridge in New York, in front of the Giza Pyramids in Egypt, in Red Square in Moscow, at La Defense in Paris, and along the Great Wall of China.